The university worked with Woolpert on the pros and cons of renovating Bryant Field in Paulson Stadium. 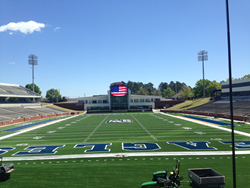 After conducting a comprehensive study with Woolpert, Georgia Southern University decided to have synthetic turf installed at Bryant Field in Paulson Stadium. Through this exercise we conducted with Georgia Southern, they were able to see where the breakeven point or payback was for them. Georgia Southern University will kick off its 2016 football season next month on solid footing, thanks to an offseason project to install synthetic turf at Bryant Field in Paulson Stadium. The project was the result of a comprehensive study the university conducted with Woolpert, a national architecture, engineering and geospatial firm. Armanini said the study found benefits for the university beyond the usual maintenance or playability improvements that usually accompany synthetic turf, including addressing stadium drainage issues and cutting transportation costs. The football team was being bused to an alternate site for most contact practices, in an effort to protect the grass field at the stadium. “Through this exercise we conducted with Georgia Southern, they were able to see where the breakeven point or payback was for them,” Armanini said. In addition to the study, Woolpert designed the installation and provided construction administration. The university’s Facilities Design and Construction Management staff hired Garbutt Construction as construction manager and brought on board Shaw Sports Turf to install LEGION 41, the material chosen for the field. LEGION 41 is a high-performance, mixed-fiber turf installed over a shock attenuation pad. Garbutt Project Manager Chris Davis said Garbutt was honored to work alongside Woolpert and the project team. He said Garbutt considers the completion of Paulson Stadium a great success. "Completing the project ahead of schedule can be attributed to a great collaborative team and our continued use of LEAN construction techniques," Davis said. Armanini agreed the project went smoothly from construction, which started in the fall, through completion this spring. Georgia Southern University, an NCAA Division I football program, will host Savannah State University on Sept. 3 at Bryant Field in the Eagles’ season-opener.